Enveloped, spherical to pleomorphic, 150-200 nm in diameter, T=16 icosahedral symmetry. The capsid consists of 162 capsomers and is surrounded by an amorphous tegument. Monopartite, linear, dsDNA genome of 152 kb. The genome contains terminal and internal reiterated sequences. All genes are transcribed by the host RNA polymerase II. and most mRNAs are unspliced. There are three temporal classes of genes: immediate-early (alpha), early (beta) and late (gamma). The immediate-early genes are transcribed immediately after infection to take control of cell defense and to activate early genes. These encode the proteins necessary for the viral DNA replication. The late genes mostly encode structural proteins. Latent genes can stop the replicative process at the early step. Certain proteins are downregulated translationaly by a leaky scanning from an upstream ORF. 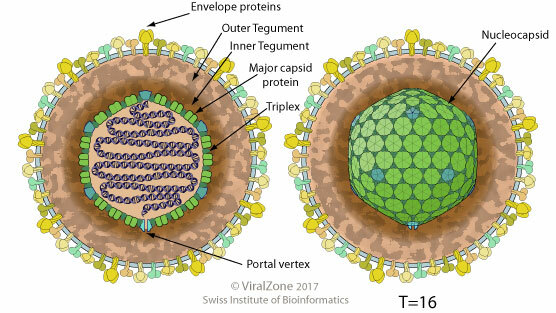 ETYMOLOGY Simplex virus: From Latin “Simplex”: simple, referring to the type species Herpes Simplex. Herpes simplex protein US12 binds specifically to transporters associated with antigen processing (TAP), blocking peptide-binding to TAP and subsequent loading of peptides onto MHC class I molecules . Herpes simplex virus 1 glycoprotein B and US3 collaborate to inhibit CD1d antigen presentation and NKT cell function . The viral kinase US3 modulates host apoptosis in different ways. It activates host protein kinase A/PKA to block apoptosis. Additionally, it also interacts with programmed cell death protein 4 (PDCD4) and retains it in the nucleus thereby inhibiting host apoptosis . Herpes simplex virus ICP34.5 confers neurovirulence by targeting the Beclin 1 autophagy protein and thus blocking host autophagy process . The viral proteins ICP27 and vhs act jointly to repress host gene transcription and blocks the cell cycle at the G1 phase . In addition the UL24 protein induces a cell cycle arrest at G2/M transition through inactivation of the host cyclinB/cdc2 complex . Herpes simplex virus inhibits the cascade leading to production of interferon-beta by targeting different cellular proteins. ICP34.5 forms a complex with host TBK1 and thus disrupts the interaction of TBK1-containing complexes with IRF3 . Another viral protein, ICP0, prevents IRF3 activation and subsequent induction of IFN-beta expression . HSV-1 ICP27 is an alternative splicing regulator of host mRNA. It has been shown to act as a splicing silencer at the 3' splice site of the PML intron 7a .